He’s the king of Musical.ly and one phenomenal and magnificent musician – that’s right, he’s the one and only Carson Lueders! Carson Lueders is the spectacular singer who brings out some of the greatest music we all have ever heard. With super catchy, hit songs including “Bae Back,” “All Day,” “POP,” and more, Carson Lueders can always get his fans up on their feet dancing along to his amazing songs and jamming out to his music all day, every day. This outstanding guy is always bringing out the very best to all of his fans – whether it is through his exceptional performances, his awesome music videos (just like the new music video he released for his song “Bae Back” which can be seen here), and of course, his spectacular Musical.ly posts. Aside from being an excellent singer, Carson Lueders is also a Musical.ly sensation and each time he shares a new post, we always know that it will go viral in no time. Carson Lueders is absolutely incredible and his talent is oh, so awe-inspiring! 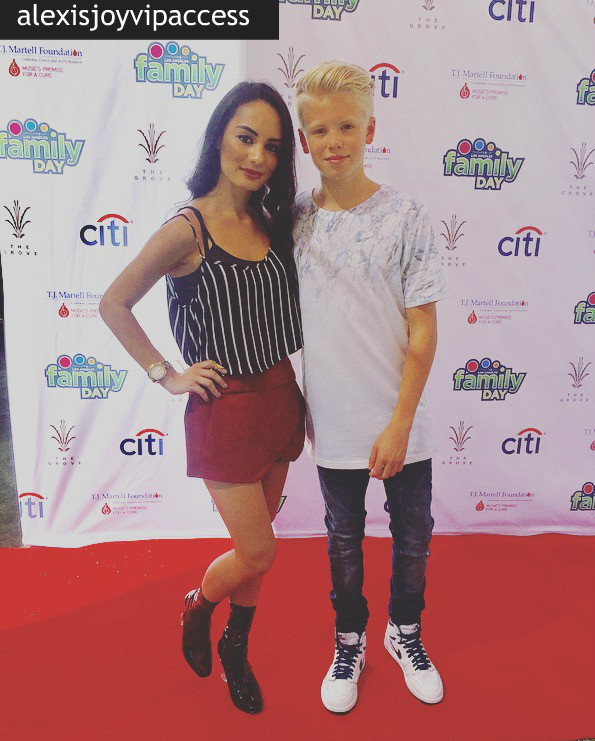 I, Alexisjoyvipaccess had the great pleasure of covering the TJ Martell Foundation’s Family Day LA event and had a fantastic time catching up with and interviewing the multi-talented Carson Lueders again at the event. Carson Lueders dished exclusively to Alexisjoyvipaccess all about his exciting, upcoming projects he is working on including some excellent, new music that fans can look forward to, what it was like working on his “Bae Back” music video, what his favorite Musical.ly is that he has created, and so much more only in our VIPAccessEXCLUSIVE updated interview. Carson Lueders even took on a fun speed round and spilled on something fans may not know about him, what his favorite emoji is and more – hear what he had to say in our updated VIPAccessEXCLUSIVE interview below. Thanks for another fun interview, Carson – always a blast chatting with you! Check out my updated VIPAccessEXCLUSIVE interview with the outstanding Carson Lueders at the 2016 TJ Martell Foundation Family Day LA event below! Next VIPAccessEXCLUSIVE: The Marvelous Jillian Rose Reed Updated Interview With Alexisjoyvipaccess At Breaking The Chains And Glitter Magazine’s Fall Reception!